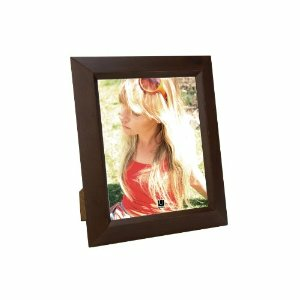 The Umbra Angelica Frame is a clean, contemporary solid wood frame with a warm Dark Walnut stained finish that shows off your favorite photo or artwork. Easel-backed for vertical or horizontal orientation, the frame measures 6 x 8 inches overall and holds one 4 x 6-inch photo. Wipe clean with dry cloth. Designed by Alan Wisniewski for Umbra - the worldwide leader in casual, contemporary and affordable design for the home.